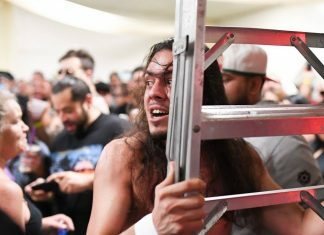 TLC is one of WWE’s most gimmicky pay-per-views of the year, because the entire show is built around the destructive matches involving tables, ladders and chairs. It is usually a fun, chaotic show with loads of carnage that sends audiences home happy, and this year’s edition will probably not be any different whatsoever. But as always, questionable booking decisions and nonsensical creative angles always loom overhead and threaten to ruin practically every show on the main roster. Let’s just take a look at Survivor Series for a second, it was a pretty decent show with some great matches, but was bogged down by some really problematic booking choices (we are looking at you Shane McMahon). Samoa Joe was jobbed out to get McIntyre over, and Shane McMahon was the last man standing for Smackdown Live. Decisions such as these are made only on the main roster, and further prove to show the gulf in class between NXT and the main shows. NXT WarGames was a fantastic show, with great matches and logical booking, the likes of which has become a rarity on the main roster. So, no matter how stacked a card might be, there’s no knowing whether the WWE Universe will get a good show out of it. The company has shown that it can make the right decisions in the past, but they sit beneath a mountain of mistakes. Hopefully TLC will be different, as we check out the 10 things WWE should avoid doing at TLC.